The 8th Chapter of Villena’s The Art of Carving, instructs how to carve four legged animals. 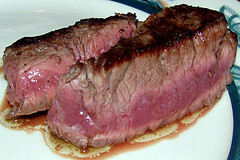 He states that one of the best cuts of beef is the short loin next to the ribs. Insert a trident carving fork from the side, below the top rib to hold the roast steady. Remove the fat and the skin on top of the meat. Do this with a short carving knife. Then change knives using a diner’s steak knife. Slice the short loin into small pieces letting them fall onto a platter placed underneath. Pour juices from the roast into a silver dish. Spoon some juice over each slice of meat making them moist because this is the tenderest and healthiest cut and the least harmful of beef. Continue carving. When it cools, if it pleases you, eat this part. 1 hr before cooking, remove the roast from the refrigerator to bring to room temperature. PREHEAT THE OVEN TO 250º F / 120º C and set oven rack to the lower middle position. Take a heavy bottomed roasting pan or heavy skillet and set the pan on 1 burner or 2 burners. Set the temperature to medium-high. Once the pan is hot sear the roast on all sides for 1 ½ - 2 min per side. Remove the roast, set it on a wire rack in the center of a roasting pan with the fat side up on the rack. Season with salt and pepper to taste and cook uncovered. Roast the meat to a temperature of 135º-140º F / 55º-60º C (medium-rare) for maximum flavor and tenderness or 140º-150º F / 60º-65º C (medium) but no more, anything more will begin to dry out the roast. Roasting it will take 25-30 minutes per pound. Do not overcook. Remove roast from oven. Let it rest 15- 20 minutes to allow the juices to redistribute themselves evenly throughout the roast. Carve according to Villena’s instructions above, serve and if it pleases you, eat it.